As described on the box, this cereal is comprised of "crunchy flakes with whole grain and baked with honey". Beneath the word "Gold", you're told that this cereal provides "long-lasting energy". If you like original Frosted Flakes, you'll probably like this new cereal. The flakes are a little more hearty and they tend to stay crunchy longer in milk than original Frosted Flakes. The presence of honey is noticeable, but it's doesn't feel so much like a flavor element as it does a sugar-substitute (which is weird because sugar is still listed second in the ingredient list). Still, this cereal tastes like original Frosted Flakes with a little more character. The claim that this cereal provides "long-lasting energy" is related to the amount complex-carbs provided by the whole grains. At 3 grams of dietary fiber per serving, this cereal has a respectable showing if it's considered a sweet kid's cereal - most of which have one or two grams of dietary fiber these days. When compared to more adult cereals like Fiber One (9 grams of dietary fiber) and All-Bran (10 grams), this cereal lags in providing real benefits from whole grains. From a health perspective, this cereal might be a nice way to transition sugar-prone kids into more healthy cereals. It has only one less gram of sugar that original Frosted Flakes, but that adds up. To quote the 80's alternative-rock band Depeche Mode, "everything counts in large amounts". So the big question remains. "Is this cereal Grrrrrrrrr...eat?" The answer is yes. It tastes pretty grrrrrrr...eat. The top five ingredients listed in order are whole grain corn, sugar, rice, corn bran and whole grain wheat. 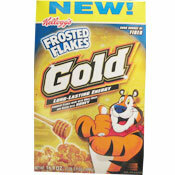 What do you think of Frosted Flakes Gold? 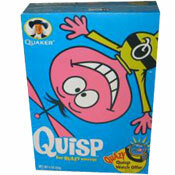 Where can you get this cereal because I had it once and it seems like they don't sell it anymore. This cereal is nothing compared to it's original. I guess if you get use to it than it can be quite satisfying. Oh and I agree, it is like chewing rocks. Too much sugar and not enough nutrients! Hard to find, great cereal, a bit thick in texture making it one chew a lot. I hold the standard of cereals, and if I like it, all people should do as I do. Only problem ...can't find it anywhere in Massachusetts except building #19. It's good what more needs to be said? Big crunchy flakes that don't get soggy in 6 seconds and it's just good. Regarding this cereal "like chewing rocks"... No, GRAPE NUTS is like chewing rocks. It's the best cereal I have ever had and before I tried it I never ate cereal at all. It just sooo good. I've been plowing bowls of cereal for 25 years and this is my favorite. I've been eating "healthy cereal" for the past 2 years and this one is the best b/c it actually has good flavor. It's a little too crunchy but it's not a deal breaker. Kids loved it. I loved it. and our lab loved the leftovers! Go Tony!! Even my kids refused to eat them. They were HORRIBLE. Something just wasn't right with the taste and they were too crunchy! I ended up feeding them to the birds. They are very crunchy and a bit hard but not too bad. I just tried this cereal and I absolutely love it. I think it might even be better than the original Frosted Flakes and that's a hard one to beat. I found the honey flavor to be on the forefront but not overwhelming yet the cereal remains very sweet (as it should). I let it sit in the milk for a while while I ate the rest of my breakfast so by the time I got to it, it wasn't hard anymore. This cereal is really awesome. I tried this cereal & it was ok. It'd be better if the flakes weren't too crunchy & hard after a while my jaw & head started to ache from all the munching & there's not enough honey flavor like honey nut cheerios as I'd like. I like regular frosted flakes better. This was kinda like chewing rocks.